It's Monday and that means a new Simon Says Stamp Monday Challenge! This week it's all about "Get in Shape". Make a dimensional project, or a shaped card. Or if you are inspired by the theme getting in shape physically, that's okay too. I was making cards a lot lately that a shape theme was a real challenge for me. 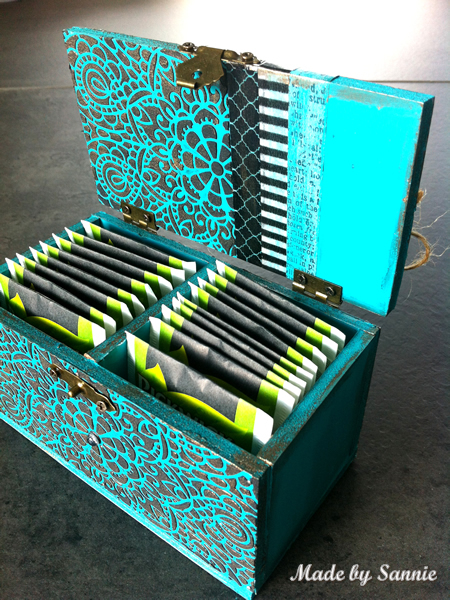 But I'm glad I came up with the idea of ​​making a tea box out of foamboard . I've already made two for myself, a larger one for my home and a little one for work, click here for that blog post. This one is for a friend of mine. She saw it, and wanted one too. First I figured out the size I wanted and cut it out of 5 mm thick foamboard. The dimensions of the box are 13 x 7 x 7 cm. The pieces I painted with Dylusions Paint Vibrant Turquoise. While I was painting, I saw I forgotten to cut out of the lid. Each piece has got two coats of paint. Normally Dylusion Paint is very liquid, but mine has became a little thicker, and that had a big impact on the drying time. The next step was to create texture with the Simon Says Stamp Circular Lace stencil and black colored Texture Paste. I partially covered up the lid. I did this for both the top and bottom of the lid. 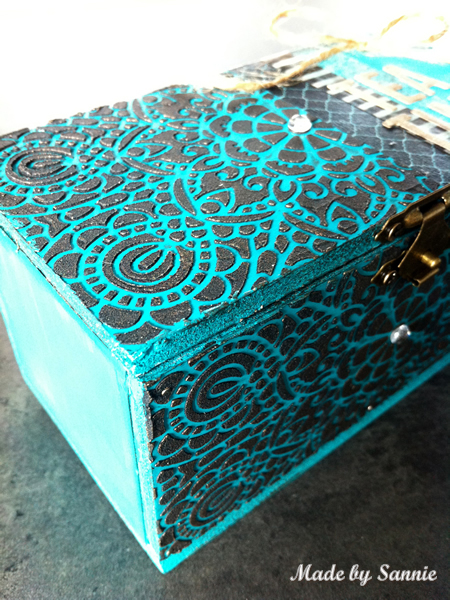 The front and back of the box I have completely covered with Texture Paste and the Simon Says Stamp Circular Lace stencil. Between each use of the stencil I cleaned the stencil, else it would have been a big mess. I also needed a lot of patience for the Texture Paste could dry. After it was dry I started to assemble the box. For assembling I used Tacky Glue and 18 mm pins. The head pins provide extra sturdiness, so that you don't have to wait till the glue is dry. As an alternative, you can also work with a glue gun. I'm not so great with that at all, and so I have found this method. In order to give the Texture Paste a little more extra, I've applied Metallique Wax Bronze Age on top of it with my fingers. This gives it a more luxurious look and as if it is some older metal. Washi tape shouldn't be missing and along with the Alphabet Thinlits and a jute bow, so it looks like the first generation. The real challenge was the hinges and the lock. 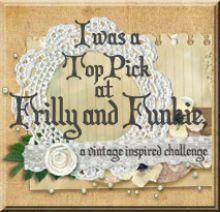 I used old ones that are very similar to those of a cigar box. The screws I rolled in Tacky Glue because foamboard is not really screwable material and the glue makes sure that they will stay in place. This is such a awesome project! 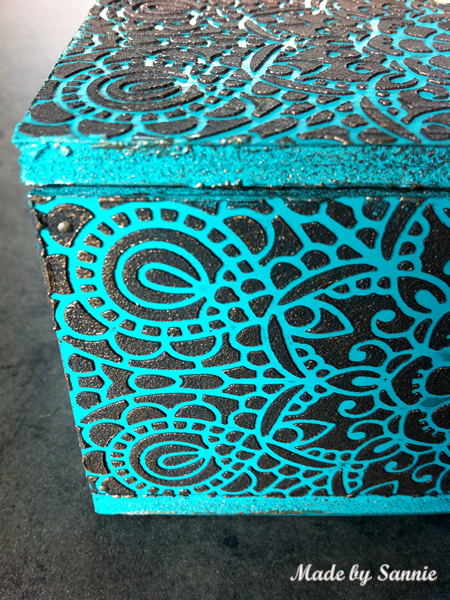 I love the pretty blue with the black lace, and the way you antiqued it! And your signature washi tape which completed the look. Gorgeous!! 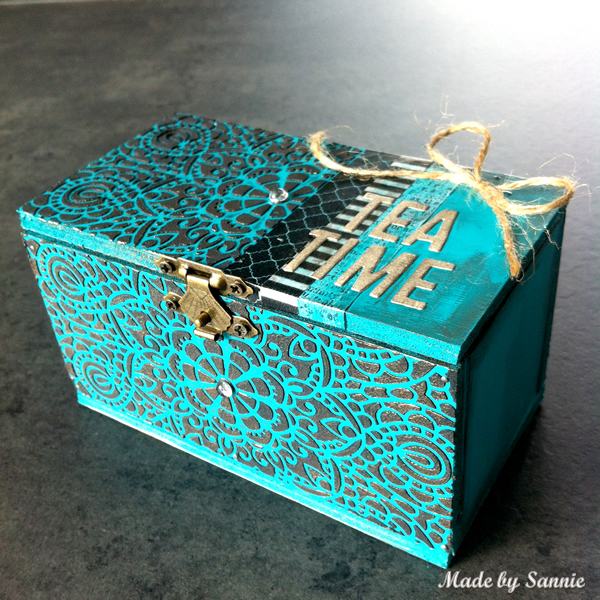 Oh, Sandra, I love the black stenciling over the blue pieces. It's such a lovely combination of colors. 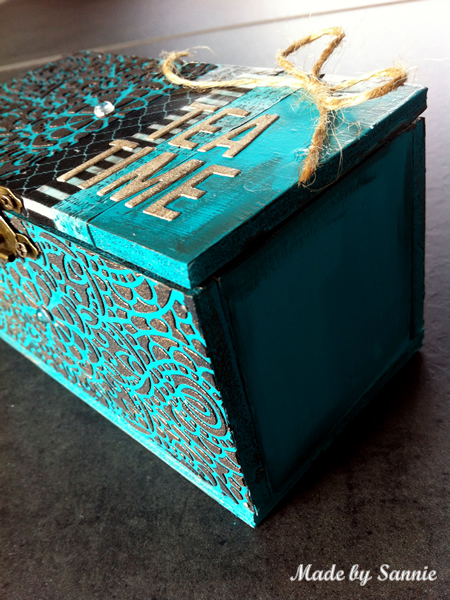 Your box is gorgeous and your friend is going to love it! 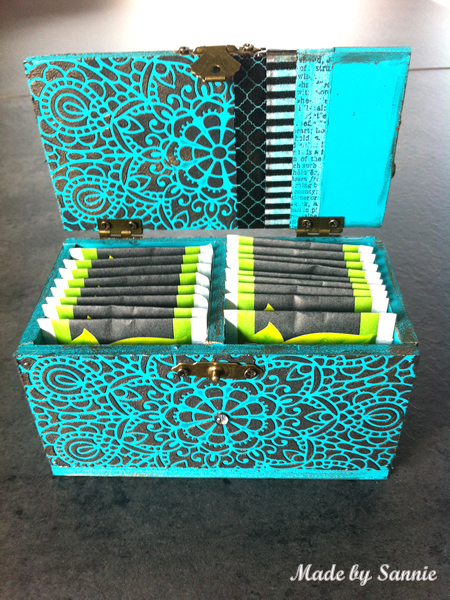 GORGEOUS tea box! Love the turquoise color! My fave! 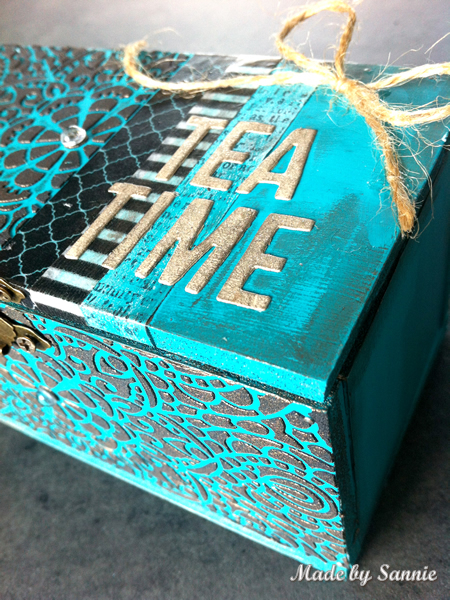 a gorgeous looking tea box- makes the tea very special! So cool-- this looks well-constructed, as I'm sure it was! I thought out was made of wood! I love this 3D project! Fabulous box, the colors are outstanding. Foam core is really useful once you get the knack for cutting it. I made a dozen tiny house Christmas ornaments one year as a gift. I really love the stuff and love what you did with it! Lovely box Sandra!! I have no idea on how to use Foam Core, because I definitely fail at cutting it!! LOL! FAb video, so interesting and useful! the project is fantastic, love the colors! I LOVE the colour and the contrast...perfect!